Morning & happy Monday everybody. Hope you had a great weekend and are gearing up for the ultimate summer kick off, Memorial Day weekend. Let the countdown begin! I was out of town over the weekend in our sister city of Detroit. Wow, there are some CRAZY drivers up their in MI…but the fact that they have a new IKEA makes it very attractive for a weekend visit. Usually we visit the Pittsburgh location, but due to a family event we stopped into that one and let me just say SO MUCH BETTER! Newer store, furniture-pick-up all in one place, more product stock and overall lighter and brighter. Highly recommend. Now, onto today’s quick post…did you see the new Sherwin Williams billboard on the side of their Prospect Ave headquarters? A partnership between area ad agency Adcom and artists GV Art + Design this vibrant mural represents all of our city’s prominent landmarks. It is a great visual celebration of our city, THANKS SW for investing in our city, we are lucky to have you as a strong Cleveland business. Have a great Monday everyone, looking forward to a hot holiday countdown week! For all the details of tonight’s big CIA Spring Show (including the Craft + Material Culture, Foundations, Integrated Media & Visual Arts + Technologies Spring Show!) visit their site for locations, times, details, etc. It looks like a wonderful event at CIA! Kudos to all the participating artists. This lovely post comes to us from a seasoned Opening Day, Tribe Fan. While I myself do enjoy a soft pretzel, a chilled beer and the roar of the crowd, I must admit I’m no expert. This post is completely awesome and covers all aspects of Friday’s first day of baseball season. It’s a great read and TOTALLY worth sharing with all of your tribe-loving pals. ENJOY and GO TRIBE! “If you’re like me you probably have this day marked in your calendar for a long time now. Even though the weather is miserable out there, the start of the baseball season signifies that summer is finally right around the corner. Who’s excited to hear the crack of the bat? To mow down a kosher hot dog? To hear a crowd of 40,000 people roar? Yeah, we all are! Please allow me to be your guide for this year’s Cleveland Indians’ home opener. By no means am I an expert on the matter but I have been going for many, many years. So hopefully some of you may find this information useful on our big day! – The gates will open at 1 pm so visitors can participate in all the opening festivities, most notably honoring former Cleveland Indians pitcher, Bob Feller, who died in late 2010. – In fact, some of the uniform changes include the number 19 patch to be worn on every sleeve in honor of “Rapid Robert”. – New food this year in the ballpark includes: Caribbean pork wings, a chicken and waffle sandwich, a beer-battered cod sandwich and half pound bratwurst and Italian sausage sandwiches! 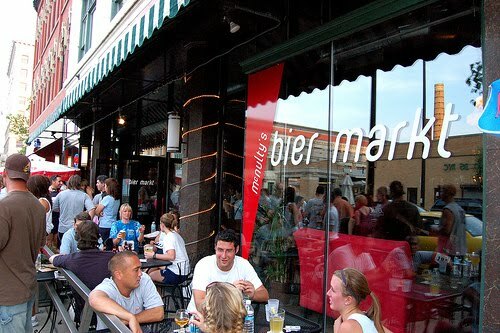 – A new popular hangout will sure to be “Your Dad’s Beer Stand” which features old-school favorites like Blatz, Little Kings, Pabst, Genesee and Rolling Rock. – This is the 18th year of Progressive Field (Jacobs Field). Crazy huh? Yup, opened in 1994. – The Indians will have the youngest 40-man roster in the big leagues. We should be spritely! – Coming back from major knee surgery, Grady Sizemore probably won’t play his first actual game until late April. – A major sore spot last year, the Indians’ new projected starting infield – Matt LaPorta (1B), Orlando Cabrera (2B), Asdrubal Cabrera (SS) and Jack Hannahan (3B) – has made only one error all spring! – Shin-Soo Choo has had a strong spring, and he’s coming off an All-Star caliber season (.300, 22 HRs, 90 RBI). He has hit exactly .300 each of the past two seasons, his OPS being an all-star caliber .884 since 2009. – Carlos Santana will see time at first base and DH. The Indians say they want Santana to play “about 145 games,” but not catching that many. He is their cleanup hitter, and he did have off-season knee surgery. – What about Pronk, you ask? Travis Hafner is the No. 5 hitter. We are all very aware of his shoulder problems and his ridiculous decline in power. In fact, he hasn’t hit more than 16 homers or driven in more than 50 runs in a season since 2007. But it’s a new year right? Another summer in the leagues. Anything can happen. – Dress appropriately! It’s going to be very cold and most likely rainy. Just accept this to be the fact now and prepare for it. – Remember that “there’s no crying in baseball!” Remind that to your friends as well. No one wants to hear how cold and crappy it is outside all day. – The game is sold out already. However there won’t be any shortages of “business men” selling tickets outside the park. Be cognizant of actual ticket prices and allow for the Opening Day surcharge. – Transportation to the ballpark – I like the combo meal. Take the RAPID down to the park and use a taxi cab to get home. The train is so much fun going there because mobs of people are psyched up for the big day. But then the cab is critical to take coming home in order to avoid the same mobs of people who have had their personalities changed by the box score, intoxication and weather. You know what I mean. street corners. Do some people watching on E. 4.th It’s the one game out of the season that we always sell out. Take advantage of the positive vibes. On your mark…get ready…go! Runners throughout greater Cleveland will be pleased to know that this weekend marks the annual Ohio City Run & Crawl, an evening 5K run through the streets of Cleveland’s historic Ohio City neighborhood followed by a pub and restaurant crawl featuring dozens of local establishments. Hundreds of runners are expected this year to fill the Ohio City streets and take in the sights, sounds and suds of the neighborhood. PLUS, after you run 3.25 miles, you will have no problem downing those fries and sunnyside up pizza! To register visit the Hermes website. 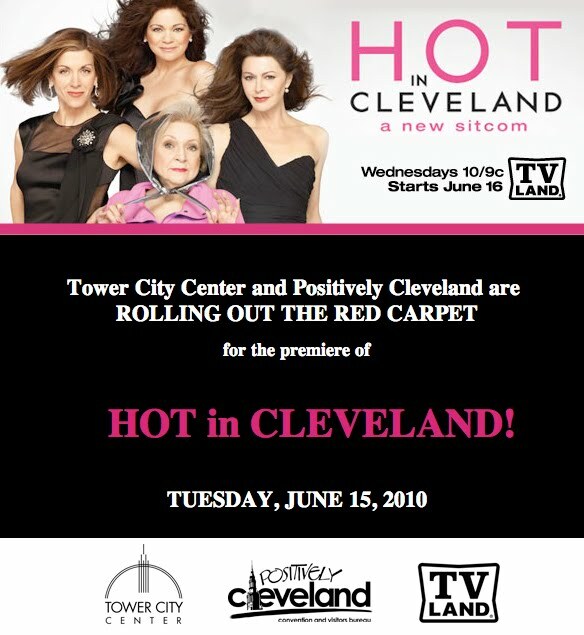 FREE Hot in Cleveland Preview Party Tickets! Tower City and Positively Cleveland has provided me 5 pairs of tickets to give out our faithful blog readers. The red carpet will be rolled out for you and a friend, complimentary valet at the Prospect Avenue Southside Valet, a stylish happy hour filled with delicious treats & cocktails and a screening of the new show Hot in Cleveland from 6-8pm at the Skylight Room in Tower City. To win these HOT tickets to this HOT party just tell me where you go, what you do or your favorite outfit that makes YOU HOT in CLEVELAND!!! BE SURE to include your email, so I can send you the tickets. Winner will be notified end of day on Monday. Pass it along to your friends.